Mr. Fernando Gibaja – Mr. Gibaja brings vast industry expertise from over 20 years of extensive international experience in hotel operations, development and management. 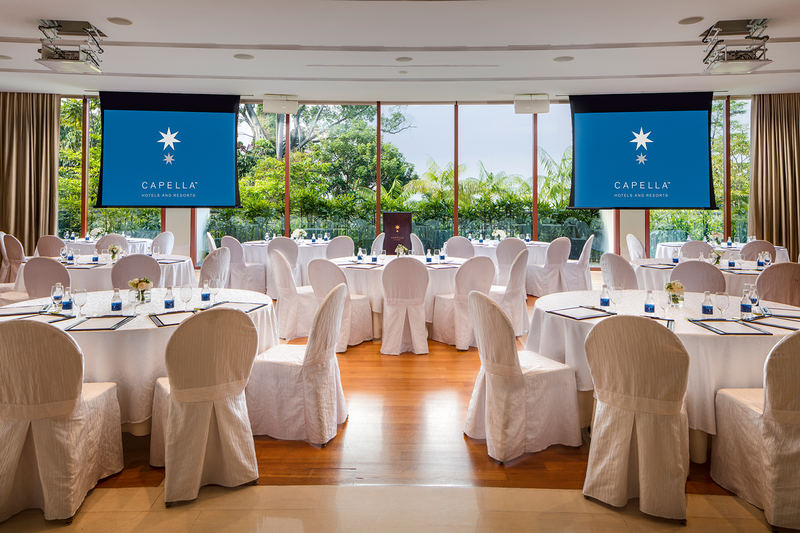 Before joining Capella Singapore, he served as the General Manager of Jumeirah Zabeel Saray Hotel & Spa, a luxury hotel located on Dubai’s iconic Palm Jumeirah, for seven years. Capella Singapore was developed to offer the best in class for the most discerning travellers, integrating the know-how of the world’s leading experts, featuring the works of London architects, Japanese interior designers, San Francisco artists and wellness specialists from Stockholm, to name a few. Capella Singapore aims to raise the bar of excellence, offering a rare, world-class experience. Capella Singapore was built in the 1880s to accommodate the British officers of the Royal Artillery and their families. Comprising of Blocks 48-51, the four classic colonial military buildings were given conservation status on 7 Aug 2000 under the Conservation of Built Heritage. Blocks 48 and 49 were used to house the Officer’ Mess and barracks for unmarried officers, where the officers and families had their meals and recreational activities such as wining, dining, dancing and tennis. Blocks 50 and 51 were used for the married officers whose families stay with them during their service on the island. 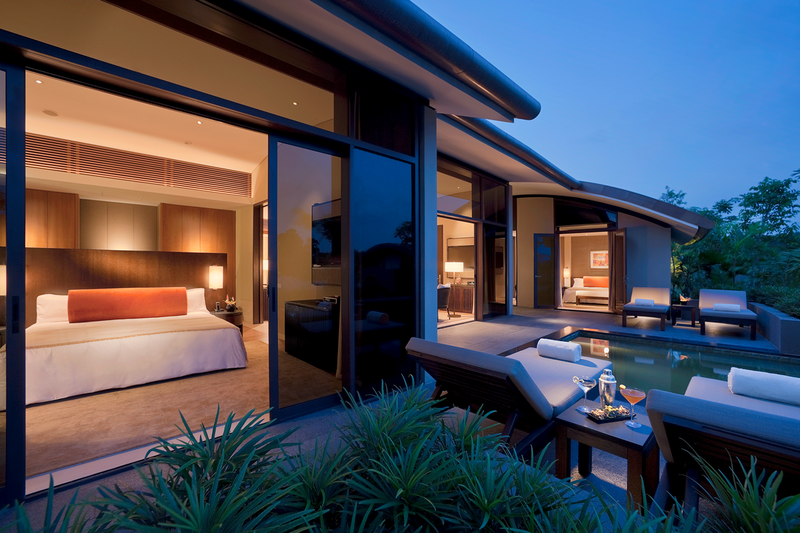 In March 2009, the buildings were masterfully restored and integrated into a modern luxury resort hotel sitting on 30 acres of lush landscape. Pritzker Architect Prize Laureate Lord Norman Foster led the masterful restoration of the heritage buildings. 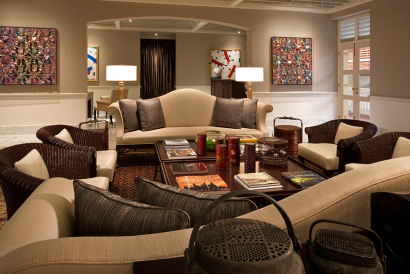 Guests are ultimately pampered 24/7 by Personal Assistants skilled in the fine art of preferential service and dedicated in ensuring every moment of their luxury vacation is custom-crafted. 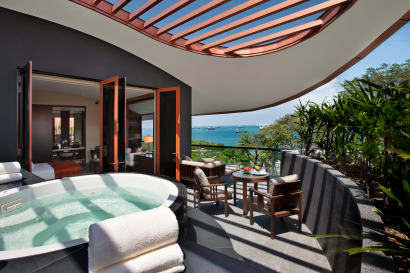 Set amid an oasis of restful serenity on Sentosa Island, guests enjoy a beautiful private haven surrounded by tropical rainforest on one side and the South China Sea on the other. 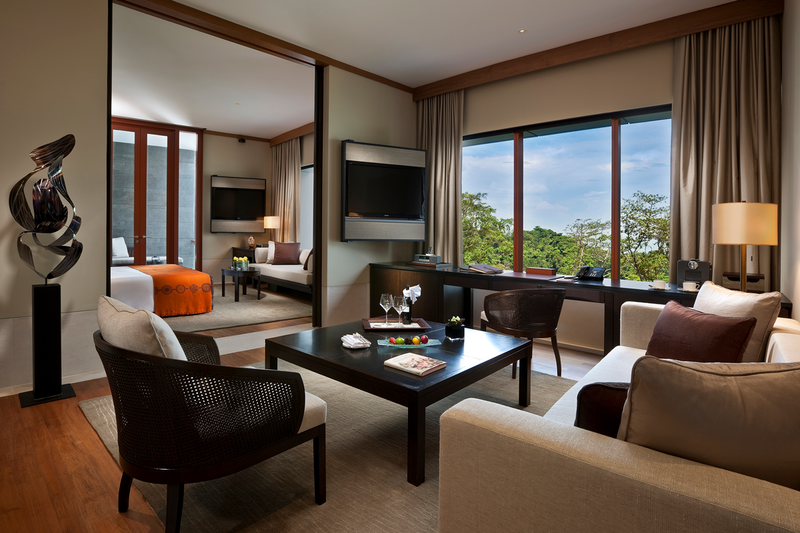 Offering Singapore’s largest lead-in room category, guests also enjoy flexible check-in and check-out times. Capella Singapore is a luxury hotel on Sentosa Island, offering a private world of splendid serenity, just ten minutes from the heart of one of Asia’s most dynamic cities, Singapore. 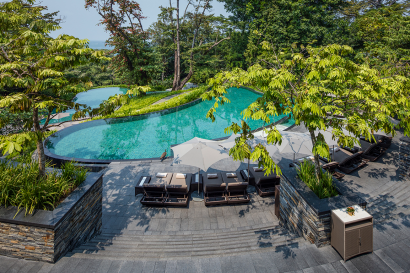 30 acres of rolling hills surround a private enclave on Sentosa Island wherein lies Singapore’s premier creational respite. Capella Singapore is located in Sentosa Island, a 10 minute drive from the Singapore city centre and 25 minute drive from Changi International Airport. 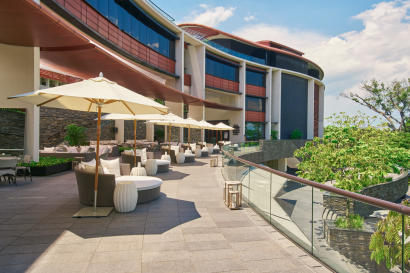 Being on Sentosa Island, Capella Singapore is in close proximity to many tourist attractions such as the beautiful beaches of Sentosa, Universal Studios Singapore, Sentosa Golf Club and One Degree 15 Marina, as well as the South East Asia Aquarium, Asia’s largest oceanarium. 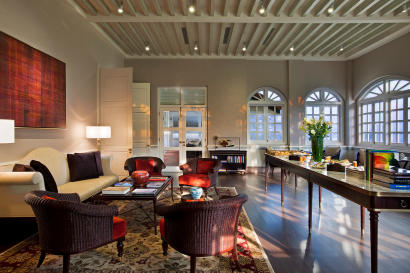 Capella Singapore is home to the largest and most luxurious “Presidential Suite”, the Colonial Manor, an old colonial “black and white” bungalow which stands at 436 sqm with three bedrooms all with en-suite bathrooms, two living areas, a stately dining room, study room, kitchen and a private swimming pool. Children will have the opportunity to participate in exciting resort activities with their families, such as canvas painting classes, cooking lessons, breakfast with the peacocks, art and heritage tours as well as swimming in Capella Singapore’s three-tier cascading pools our lounging in giant unicorn floats. Children will also receive special amenities such as pink or blue bathrobes and bedroom slippers, colouring materials when dining at the hotel’s Mediterranean all-day dining restaurant and more. 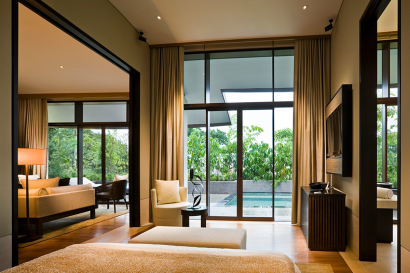 Provides a private plunge pool and a spacious living area which can be separated by sliding doors for an intimate gathering. 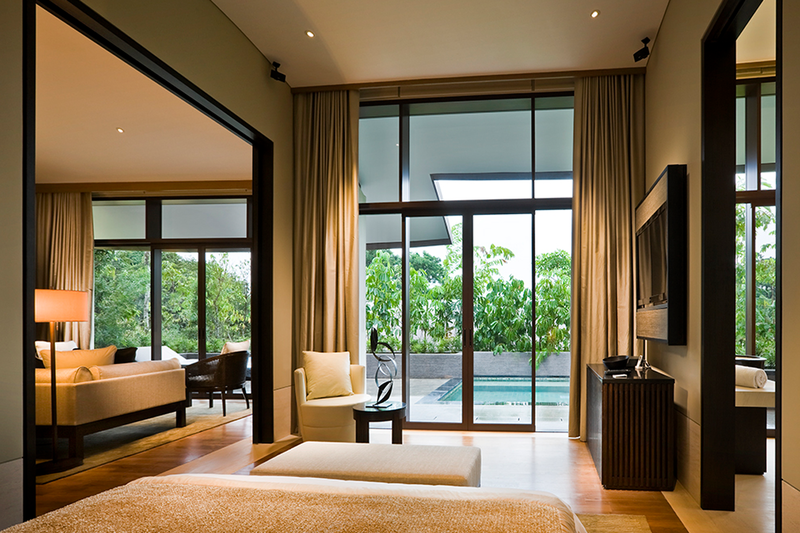 Each unit comes with private outdoor shower facilities. Our beautifully restored buildings offer 436 square metres of living space and come complete with a stately dining room, study, lounge room, fully equipped kitchen and a mini lap-pool. • Bob’s Bar: A tropical bar serving Cuban-inspired cuisine and rum-based cocktails. Signature “bistronomy” themed menu emphasizes the finesse that comes with a fine-dining experience and rich wholesome flavours. Signature dishes include a Homemade Chicken charcuterie served with a mesclun salad and whole grain mustard cream, roasted monkfish with white bean stew, tomato confit, and chorizo, as well as a traditional Italian cassata made with a fragrant pistachio sponge, raspberry sorbet, candied fruit. Taking inspiration from the age-old spice routes in Southern and Western China, Cassia blends traditional and regional cooking with haute Cantonese techniques, all overseen by Executive Chinese Chef Lee Hui Ngai. 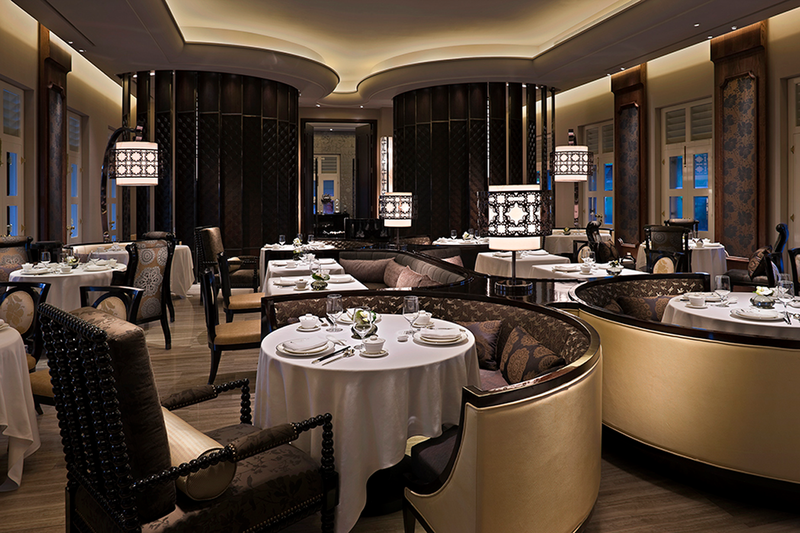 Signature dishes include Peking Duck and Double-boiled Soups. In partnership with cocktail consultants Proof & Company, it offers handcrafted speciality cocktails, Singapore’s most exclusive rum collection as well as traditional Cuban delights. 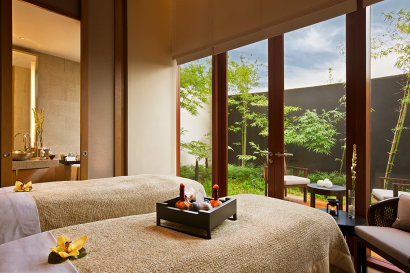 • Auriga spa: Its signature treatments are matched with each moon phase using 100% natural products from The Organic Pharmacy. Guests enjoy nine luxurious treatment rooms with private outdoor gardens. • Grand Ballroom: Singapore’s first circular ballroom with a glass-dome skylight, its centrepiece is a magnificent glass sculpture by Nikolas Weinstein, which floats from the dome’s centre. Warm, natural skylight fills the ballroom’s 8,393 square feet of pillarless space, designed to comfortably accommodate 400 guests. 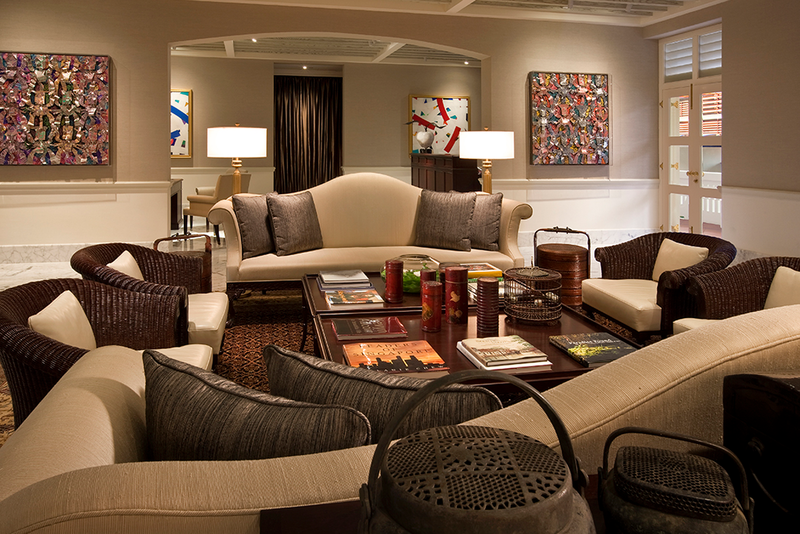 • The Gallery: Designed to hold up to 100 guests, The Gallery offers a boutique setting for exquisite wedding celebrations and social and business receptions. • Sentosa Rooms: Three meeting rooms, Sentosa I, II and III, feature floor-to-ceiling windows and separated by an operating wall, range from 1,098 to 1,463 square feet, and can accommodate groups of between 70 and 100 guests. • The Patio: Looks out on the stunning South China Sea, and a heritage tree that has aged with grace. • Cascading pools: Perfect for a whimsical evening surrounded by the glistening waters of the cascading swimming pools, the second tier poolside presents an unpretentious natural setting for an elegant cocktail party or dinner. 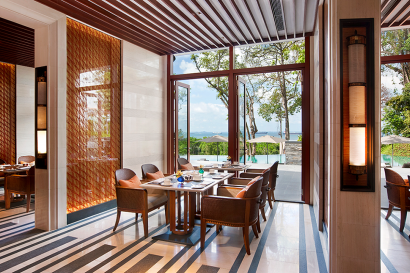 • The Portico: Adjacent to the Grand Ballroom, The Portico is an adjunct space, fitted with a tranquil water feature, surrounded by Capella Singapore’s lush forestry – a place that is perfect for pre-function receptions.